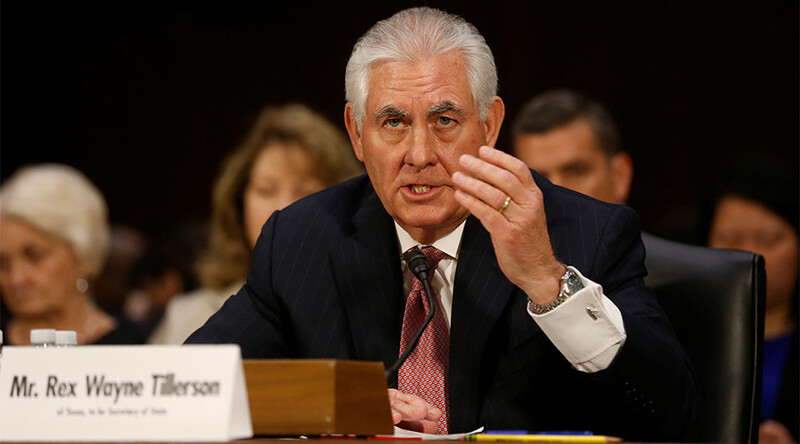 A handful of senior US diplomats resigned their posts just as the Senate is expected to confirm Trump’s nominee for secretary of state, former CEO of Exxon Mobil, Rex Tillerson. Among the resignations were Undersecretary of State for Management Patrick Kennedy, who planned to retire on Friday. Kennedy had served under both Democratic and Republican administrations. He was joined by two assistant secretaries, Joyce Barr and Michele Bond, who both resigned on Wednesday. Gentry Smith, who directs the Office of Foreign Missions, was also departing. Acting spokesperson for the State Department Mark Toner said in a statement such resignations are standard in every transition. The four join a growing list of long-serving diplomats declining to stay on into the Trump administration. That list includes Victoria Nuland, assistant secretary for European and Eurasian Affairs, and Gregory Starr, the assistant secretary for diplomatic security. Starr retired on Inauguration Day. Lydia Muniz, director of the Bureau of Overseas Building Operations, departed the same day. The resignations were the entire senior management, the Washington Post reported, and four State Department officials confirmed that the resignations were unexpected. “That amounts to a near-complete housecleaning of all the senior officials that deal with managing the State Department, its overseas posts and its people,” according to the Washington Post. Diplomatic watchers tweeted there are 13 senior management teams. The resignations do, however, create more high-level openings for the new president to fill, including deputy secretary roles. Of those resigning, Kennedy’s position was to oversee the department’s budget and finances, security, global facilities and consular services. He was highly criticized for insufficient security during the 2012 Benghazi, Libya attack when four Americans, including US Ambassador to Libya Christopher Stevens, were killed by jihadist militants. None of the officials linked his or her departure explicitly to Trump, but “many diplomats have privately expressed concern about serving in his administration, given the unorthodox positions he’s taken on many foreign policy issues,” AP reported. In his foreign policy speech in April 2016, Trump laid out goals his administration would take: to defeat terrorists in the Middle East and promote regional stability; fixing relationships with Russian and China; and reforming NATO and rebalancing financial commitments of the US.